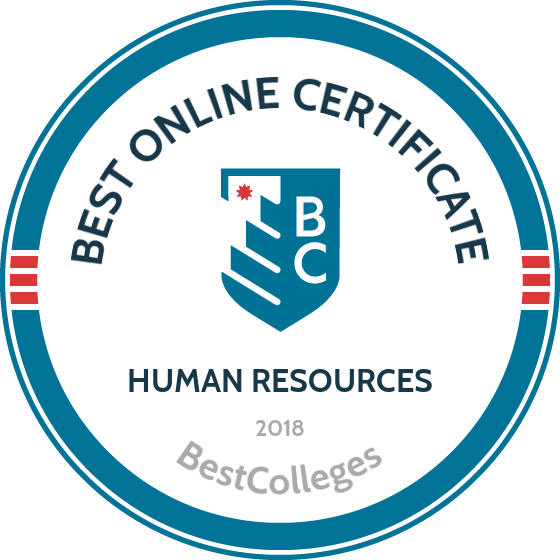 What Are The Best Online Graduate Certificate in Human Resources Programs? What Will I Learn in an Online Graduate Certificate in Human Resources Program? What Can I Do With a Certificate in Human Resources? An online graduate certificate in human resources demonstrates expertise in staffing, training, development, and employment law. The certificate improves knowledge of human resources fundamentals and increases job prospects. As employment opportunities continue to evolve, organizations require professionals who possess the skills to meet both current and future workforce demands. Those with a graduate certificate in human resources identify, develop, and support talented professionals. The Bureau of Labor Statistics projects a 9% increase in human resources manager positions by 2026. The University of Virginia offers a graduate certificate in leadership in human resources management that is ideal for HR professionals who want to advance their careers. Adult learners can complete this 15-credit program in just one year by enrolling in one or two courses each semester. The program includes courses on a variety of topics, such as strategic compensation, staffing and career management, organizational change and development, and organizational performance management. The program is delivered fully online through the School of Continuing and Professional Studies and requires that students earn a minimum 2.7 GPA throughout the program to graduate. Applicants to this certificate program must have a bachelor's degree to be considered. They should also be experienced in a career related to human resources, having held roles such as manager or supervisor. Penn State World Campus offers a graduate certificate in international human resources and employment relations that equips students with the skills needed to compete in the global marketplace. The 12-credit program teaches students about human resources law and policy, organizational behavior, and best practices in the field. This program is delivered in collaboration with the university's School of Labor Employment Relations (LER) and offers an international perspective that emphasizes human resources in multinational organizations. Courses are taught fully online by LER faculty, who are leading experts with extensive experience in teaching adult learners. Applicants must have an undergraduate degree and submit both a resume and statement about why they wish to earn this certificate to be considered. They must also submit an official transcript and must have minimum GPA and test scores. Students are not eligible for federal financial aid, but the school does offer a deferred payment plan. Brandman offers a graduate certificate in human resources management that equips students with a knowledge of career management, conflict, talent management, and negotiation. This 15-credit master's program includes three foundational courses and two electives. These courses cover topics like labor relations and collective bargaining, ethics, and human resources information systems. Applicants must have a bachelor's degree and a minimum 3.0 GPA to be considered. Alternatively, they could have earned a minimum GPA of 2.5 to 2.99, coupled with a satisfactory score on a graduate admissions exam. Other alternative admission criteria include either having a master's degree or submitting a portfolio that includes writing samples, a resume, and professional recognitions along with a statement of purpose. Brandman is accredited by the Western Association of Schools and Colleges. The University of Houston – Clear Lake (UHCL) offers a graduate certificate in human resources management that provides extensive training and preparation for those who want to pursue leadership roles in the field. This program is delivered through the College of Business, which is accredited by the Association to Advance Collegiate Schools of Business. Adult learners can complete this 12-credit certificate program in just one year on a part-time basis by enrolling in two classes per semester in the fall and spring terms. The curriculum includes coursework on a variety of topics, including general business management, personal mastery and influence, and change management. Graduates are also prepared to sit for certification exams like the Professional in Human Resources and Society for Human Resource Management Certified Professional designations. Graduates can apply the credits earned in this program towards either the university's master's in human resources management or its MBA with a human resources management concentration. UIS offers a graduate certificate in human resources management that prepares students for leadership roles in the field. Students examine topics like employee relations, labor relations, and staffing, all of which prepare them to achieve organizational success. They also develop an understanding of concepts like performance appraisal, compensation, and incentives. This online graduate certificate in human resources includes nine credits of coursework and a prerequisite course in either human resources management or organizational behavior. Students must maintain a minimum GPA of 3.0 throughout the program to graduate. Admission to this certificate program is limited, although it is guaranteed for those already admitted into a UIS graduate program. Applicants must submit an official undergraduate transcript with a minimum GPA of 3.0 to be considered. Stony Brook offers an advanced graduate certificate in human resource management through the School of Professional Studies that is ideal for experienced practitioners to improve their management and policy competencies. This program, which is offered in collaboration with the university's College of Business, it requires 21 credits of coursework, 18 of which can also fulfill requirements for a master's in either human resource management or liberal studies. Students must complete seven, three-credit classes that explore topics such as employee relations, human relations in the workplace, and organizational change management. They must earn their certificate in three years, although this deadline extends to five years if a student is concurrently enrolled in a Stony Brook graduate program. The university maintains an active Society for Human Resource Management student chapter, which allows them opportunities for education and networking outside of classroom studies in affiliation with the world's largest association for human resource management experts. NU offers a graduate certificate in human resources management that is ideal for working adults. This program explores topics like talent recruitment and training, compensation plans, and rights and obligations of both employees and employers. This 18-credit online graduate certificate in human resources is delivered through the College of Professional Studies. The curriculum includes courses on a variety of topics, such as total compensation, strategic recruitment, training, and performance management, and employee rights and employer obligations. Students can complete this program in just one year of full-time study, or another six months when studying part-time. All online students pay the same tuition rate, regardless of residency. Applicants must submit a completed application, a statement of purpose that explains their reasons for enrolling, a professional resume, and official undergraduate transcripts to be considered. LSU offers a graduate certificate in workforce development through its School of Human Resource Education and Workforce Development that can be completed in just six months. This 18-credit online graduate certificate in human resources emphasizes technological advancements, talent development, and productivity pressures. The curriculum includes courses on a variety of topics, such as product evaluation design, principles of workforce development, workforce planning and analysis, and instructional design for human resource development. Distance learners at LSU have access to the university's library, advising services, and career counselors. Applicants must have a bachelor's degree from an accredited institution with a minimum GPA of 3.0 to be considered. Those who don't meet the GPA requirements must also submit GMAT or GRE test scores. LSU is accredited by the Southern Association of Colleges and Schools Commission on Colleges. DU offers a graduate certificate in HR management and development through the College of Professional and Continuing Studies that prepares students to advance their careers in human resources. Students in this graduate certificate in human resources program learn how to assemble and lead teams through transitions and crises, influence organizational success, and examine business lifecycle phases to appropriately analyze benefits and compensation. This 24-credit program consists of six, 10-week courses and can be completed either on-campus or online. Graduates are prepared to pursue leadership positions such as human resources manager, training and development manager, and chief human resource officer. The university offers a variety of career services that can help students identify these kinds of employment opportunities. Students who decide to pursue additional studies can apply the credits earned in this program towards a master's degree in strategic human resources. CMU offers a 15-credit graduate certificate in human resources administration that teaches students the skills needed to oversee labor relations, employee training, and organizational development. This program is ideal for working professionals with busy schedules and delivers course in eight-week terms. The curriculum includes courses on a variety of topics, such as public personnel management, communication in conflict management, and gender and generational supervision. Distance learners at CMU have access to the university's wide array of services, including a writing center and library research assistance. Applicants must have a bachelor's degree with either a minimum cumulative GPA of 2.7 or a minimum GPA of 3.0 in their final 60 credits of undergraduate study to be considered. Those who cannot meet these GPA requirements may be considered for conditional admission. CMU is accredited by the Higher Learning Commission. UMUC offers a graduate certificate in human resource management that prepares graduates to pursue careers as executives, generalists, and specialists in the field. Students can earn this certificate by completing just 12 credits of coursework, three of which can be transferred in from an undergraduate degree. This program emphasizes strong problem-solving skills can prepares students for management positions in several different types of organizations. The curriculum for this certificate was designed by employers, industry experts, and scholars and includes courses on a variety of topics, such as intercultural work environments, conflict management, policy design for organized goal attainment, and employee relations. Students must maintain a minimum GPA of 3.0 throughout the program and complete all coursework within five consecutive years of admission to graduate. UMUC is accredited by the Middle States Commission on Higher Education. GGU offers a graduate certificate in human resource management that is ideal for current professionals who want to advance their careers without having to earn a full graduate degree. This program allows students to focus on the topics that are most relevant to their interests as they work closely with faculty to design a course of study. This 18-credit graduate certificate in human resources includes courses on several topics, such as benefits administration, people management in international settings, labor relations, and employment law. There is also an internship requirement where students apply the lessons learned in the classroom to a real-world setting and then discuss that experience in a written paper. All courses are delivered asynchronously online, allowing students to complete coursework at their own pace. The university does not mandate synchronous participation in an effort to accommodate working adult students. GGU is accredited by the Western Association of Schools and Colleges. EMU offers a 15-credit graduate certificate in human resource management that is ideal for those who understand and practice human resource strategies and want to increase their organizational effectiveness. This program prepares graduates for entry-level and management roles, depending on their level of experience in the field. This certificate is offered through EMU's College of Business and includes courses on a variety of topics, such as organizational theory and behavior, benefits and compensation, management in unionized settings, and leading innovation and change. Applicants must have a bachelor's degree with a minimum GPA of 2.7 and submit a complete application and official transcripts to be considered. EMU participates in the State Authorization Reciprocity Agreements (SARA) program, which provides oversight of distance learning programs. Those who live in a SARA state are eligible for this program, and those who do not should check with the university to learn if they can enroll. TESU offers a graduate certificate in human resources management that is ideal for professionals who want to learn how to help guide their organizations through ongoing changes and meet desired goals. This 12-credit program is delivered through the School of Business & Management and can ultimately allow students to transfer their credits into a master's program in either management or human resources management. The curriculum includes courses on a variety of topics, such as market-connected culture, legalities and ethics, strategic recruitment and selection, and workplace learning. Applicants must have a bachelor's degree with a minimum GPA of 3.0 and two years of relevant work experience to be considered. They must also write an essay for their application that allows the committee to further assess their background and their writing skills. TESU is accredited by the Middle States Commission on Higher Education. SNHU offers an online graduate certificate in human resource management that teaches students the leadership skills needed to consistently increase organizational performance. Those enrolled in this certificate program learn how to support employees and management, oversee labor relations, and devise appropriate frameworks for compensation and benefits. Courses are delivered asynchronously online in 10-week terms throughout the year, allowing students to complete coursework at their own pace. The curriculum includes three required courses and two electives on topics such as leadership and ethics as well as human behavior in organizations. All online students at SNHU pay the same tuition rate, regardless of residency. There are also reduced tuition rates available for U.S. service members and the spouses of those on active duty. The school's large alumni network helps students and graduates find internship and employment opportunities. SNHU is accredited by the New England Association of Schools and Colleges. Marygrove offers a graduate certificate in human resource management that is perfect for HR professionals and those in related careers who want to advance their careers and better serve their organizations. This certificate emphasizes human resource management in business, government, and nonprofit organizations. The curriculum is aligned with the standards of the Society for Human Resource Management and includes courses on a variety of topics, such as managerial finance and business ethics as well as a capstone seminar and project that involves a team-based decision-making simulation. Students can also select electives on topics like effective communication, human resource information systems, and organizational behavior. Most courses are seven weeks long and typically two or three classes are offered during each semester. Students must maintain a minimum GPA of 3.0 throughout the program to graduate. Marygrove is accredited by the Higher Learning Commission. EC offers a graduate certificate in human resource management that is ideal for working adult students. This graduate certificate in human resources teaches students how to solve organizational problems with in-depth knowledge of labor relations, compensation and rewards, talent recruitment and retention, and employment law. Students can complete coursework in on-campus evening classes or entirely online. The 18-credit curriculum includes six courses on a variety of topics, such as diversity in contemporary organizations, total rewards, strategic planning, and leadership. Courses are taught by faculty who are seasoned HR professionals with several years of experience. Online classes are offered in seven-week terms throughout the year. Students must maintain a minimum GPA of 3.0 throughout the program to graduate. EC is accredited by the New England Association of Schools and Colleges. Davenport offers a human resource management graduate certificate that is ideal for professionals who want to deepen their understanding of the field. Students can complete this 12-credit program alone or alongside an MBA if they have fulfilled Davenport's prerequisites for that professional degree. This program is offered through the Donald W. Maine College of Business and is ideal for those with a bachelor's degree who want an additional credential in the human resources field. The curriculum includes a required advanced problem solving in human resource management course and a list of elective courses. Students must complete three of the four electives offered: international human resources, employment law and labor relations, finance of compensation and benefits, and organizational development and training. Applicants must submit official transcripts, a professional resume, and two letters of recommendation to be considered. Davenport is accredited by the Higher Learning Commission. ISU offers an online graduate certificate in human resource development that prepares graduates for careers in industry, government, higher education, and nonprofit organizations. This program emphasizes design, development, and deployment of human resources activities like training and education as well as the evaluation of these activities. Students can choose to earn this certificate as a specialization within a master's degree in human resource development. The 12-credit curriculum includes four required courses: developing performance-based occupational curriculum, systematic design of human resource development programs, leadership in human resource development, and rationale and evaluation of human resource development programs. While students in certificate programs at Davenport are ineligible for financial aid, they may qualify for the school's payment plans or veterans benefits. Applicants must have a bachelor's degree from an accredited institution with a minimum cumulative GPA of 2.7 or a minimum GPA of 3.0 in all graduate level coursework to be considered. ISU is accredited by the Higher Learning Commission. Franklin Pierce offers a graduate certificate in human resource management that is one of the only in the state that is recommended by the Society for Human Resource Management. This online program is offered through the College of Graduate and Professional Studies and provides a system-level perspective of concepts such as organizational behavior, staffing, compensation, performance, and regulations. After completing this online graduate certificate in human resources, students can choose to apply for admission into the school's MBA in human resource management program. Applicants must have a bachelor's degree from an accredited institution with a minimum GPA of 2.8, competency in accounting, statistics, and computer skills, and submit a completed admissions portfolio to be considered. Franklin Pierce is accredited by the New England Association of Schools and Colleges. While specific coursework required for an online graduate certificate in human resources varies by school, every certificate program provides knowledge necessary to oversee and manage an organization's programs. The sample curriculum below exemplifies the types of classes required for this certificate. Strategic Staffing: This course provides a strategic framework to help organizations achieve their goals. It examines policies and protocols for immediate and long-term planning and teaches students to carefully recruit and select human capital. Coursework explores concepts such as rightsizing and employee separations and retention, preparing students for careers as recruiting managers. Employment Law: This course explores the effect of state and federal regulations on human resources functions. Topics include equal employment opportunity, wages and overtime payment, and limits on management's rights. Students learn to prevent unnecessary litigation and to resolve workplace disputes, in preparation for careers as labor relations specialists. Training and Development: Topics include implementing a needs analysis, creating and executing an implementation plan, and ensuring that the plan reflects best practices in the field. These skills in organizational effectiveness are crucial for training and development managers. Compensation: This course explores how organizations leverage pay systems to improve their effectiveness. Students examine how organizations design pay, compensate according to performance, and administer pay systems. Students learn to evaluate position descriptions to determine classification and salary. This course prepares students for careers as compensation and benefits managers. Professionals in human resources need the ability to plan, lead, and coordinate administrative functions. They must be highly perceptive to select and cultivate the talent needed to achieve workplace goals. They must also be skilled communicators to ensure effective collaboration between employees and management. Because many careers require these skills, a graduate certificate in human resources leads to numerous professional opportunities. Human resources managers plan and direct an organization's administrative functions, including overseeing recruitment efforts, devising strategic plans, and liaising between employees and management. Training and development managers plan, oversee, and coordinate employees' ongoing education. These professionals generally oversee a staff of specialists. These managers plan, create, and lead programs to determine how much and in what way an organization pays its employees. They also coordinate retirement plans, health insurance, and other employee benefits. An online graduate certificate in human resources provides flexible career options. The following table provides the 2016 median salaries for additional professions in human resources. Those earning a graduate certificate in human resources without first obtaining an associate or bachelor's degree may consider transferring certificate credits into an undergraduate program. Degree holders are better prepared, and more likely to be hired, for managerial positions, and they earn higher salaries. For example, the median human resources specialist salary is about $59,000 per year, whereas a human resources manager earns about $107,000 annually. Below are bachelor's degree options related to human resources. Business: This program instructs students in decision making, project management, communication, and teamwork, while incorporating business tools and principles. Students learn to assess and respond to organizational challenges and opportunities. Industrial Relations: Students study the historical, legal, and economic issues that affect an organization's employees. Coursework examines people and policies; students understand the ways in which individuals, groups, and organizations address workplace issues. Psychology: Students learn to analyze human behavior, engage in scientific reasoning, and understand how people behave. The program covers theoretical perspectives and research methodology. The best online graduate certificate in human resources programs are regionally or nationally accredited. The U.S. Department of Education (ED) and the Council for Higher Education Accreditation (CHEA) assess programs to evaluate their intellectual rigor. Presently, six regional accreditation bodies assess U.S. colleges and universities. National accreditation is generally reserved for specific programs of study, such as vocational training. Both the ED and CHEA accredit schools with online degree programs. In addition, look for a program accredited by an agency such as the Association to Advance Collegiate Schools of Business or the Accreditation Council for Business Schools and Programs. This specific designation reflects the highest standard in management education. SHRM helps human resources professionals become more effective, advance their careers, and work strategically with key stakeholders. The organization has been a thought leader in the field for more than 60 years. Founded in 1951, NHRA provides networking and development programs to support the career advancement and success of human resources professionals. NHRA offers member forums and on-demand, webcast, and audiocast programs. This global organization promotes studies in human resources development theories and practices. AHRD distributes research findings and educational materials and creates networking opportunities for its members. Those pursuing a graduate certificate in human resources should complete the Free Application for Federal Student Aid (FAFSA) to determine their eligibility for federal grants, loans, and work-study positions. Contact your school's financial aid department to learn about scholarship opportunities. In addition, professional organizations such as SHRM offer scholarships to undergraduate students pursuing human resources degrees.